Do I sound bitter? I suppose so. Injustice always rankles. The E23 (write it down, learn it, use it: “e-twenty three”) can be defended by its defenders though. The car represented a new market for BMW so anything was better than nothing. The next model sold a bit better (and not worse). The XM’s sales fitted into a downpointing jagged line, a nose-dive to extinction. Towards the end the production line at Rennes was a carpark. The 605’s sales held steady at or near irrelevance, so they judge it. The twenty-three’s successor sold a bit better: thirty thousand units more sold over an eight-year period. And the E38 (1994-2001) achieved another twenty thousand in its eight-years. So, the 7’s sales grew a bit even as the model-cycle shortened by 24 months. 1977 BMW 728 bonnet and badge. Doesn’t that make you think? BMW kept on hammering at this problem: the twenty-three and its successors all achieved sales figures in the same order of magnitude over similar periods of time. They didn’t give up. Isn’t it interesting that the 7-series sale figures which are essentially steady and respectable are judged as disastrous for the 604, 605 and XM (and others in that class). Peugeot’s 605 managed 252 185 units in a decade, not far off the e-23 and friends. Failure. We have to look at the pattern of sales too, not just the final tally. The first three 7s sold about the same number every year. Even as BMW pulled the plug on each model cycle, there came another ten thousand customers in the final six months, ready to write a cheque for a just-about-obsolete car. I have always been fascinated by that phenomenon. Why didn’t these people hang on another six months? The reason they do buy a run-out model is because the car is competitive right until the end. Even if the next car is better, the outgoing car is more than good enough. And further, the customers of the outgoing car know there is a buyer for their vehicle 36 months down the line. As it’s a Sunday I am not going to pursue the highest level of diligence. Relying on my memory, I can say the e-twentythree didn’t fare that well critically in its first years, with Car in particular condemning its wayward handling. Prodigious thirst? The straight-six had a four-barrel Solex carburettor and I suspect keeping it on song was harder than tuning the Valére organ**. One conclusion here is that while BMW could support a model that sold in the order of 300,000 units a years, others couldn’t. A little word about the styling: it is credited to Manfred Rennen. ** You won’t find references like that at other automotive websites. Remind me again, how much do we charge for this service? Richard, the numbers are most interesting. Perhaps we should remember that only 21,807 Baroque Angel saloons were made from 1952-1963, rather less than a good year for the 7 Series. As you say, BMW make the 7 Series because they can afford to, rather than for profits or production numbers. Carl Borgward probably thought likewise in producing 1032 Hansa 2400s from 1952-59. In both cases there was probably a bit of regional pride at play, giving the political leaders and captains of industry in the Hanseatic north and in Bavaria a reason not to be seen in a Mercedes-Benz. The idea of moving upmarket cause conflict in the BMW boardroom from the conception of the E3 2500/2800 and probably before, with a view held by some directors that the company should use the new capacity from the takeover of Glas to produce a larger 700 successor, rather than presumptuously invading Mercedes-Benz territory. In the case of the E3, in most markets it was priced to compete with the Strich Acht W114 200-250, rather that the Sonderklasse – that ambition came later as the 5 series grew in size and popularity. Also, for BMW to be taken seriously in the USA, something larger than the Neue Klasse 1500-2000 was a necessity. 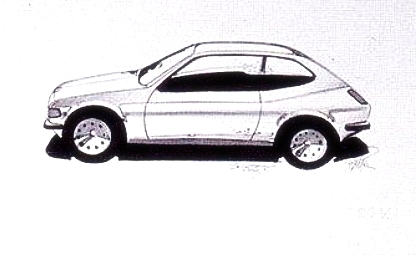 I had a look at the Manfred Rennen micro-biography and found this intriguing proposal from 1975 for a small BMW. It shows that BMW did have notions of moving into a price area below their heartland long before the Rover disaster and the 1 Series and MINI. In the mid ‘70s they probably could do no other, as the automotive world, and conspicuous consumption generally, went through an existential crisis brought about by geopolitical tensions. You are nor seriously comparing the E23 to the 604 or the XM, are you? Compared to its main competitor, the Benz W116 (around 450,000), the E23 doesn’t look too bad for a first time attempt at the market sector from a company that ten years before was at the brink of bankruptcy. The 604/605/XM’s true competitors E21 (600,000), E28 (700,000), E34 (1.3M) or E39 (1.4M) look much better. At least as long as you don’t look at Merc’s W114 ‘/8’ (1M) or W123 (2.5M). What BMW certainly learned from the E23 is the German mantra that if you intend to do something, you either do it properly or you better don’t do it at all. The XM in particular is a sales disaster because it lost a market its predecessors owned (DS 1.5M, CX 0.9M). We don’t need another XM debate here (as in I don’t want to bore people) but I do feel the XM maybe wasn’t really a CX replacement. It cost far more. The CX seems to have been priced like a mid-range Cortina. The XM did quite well if freed from the burden of matching its predecessor’s sales success. The thing you are asking for is part of the E23’s dirt water management, an engineering concept Mercedes introduced with the W116 where the A-posts catched water coming sideways from the windscreen and guided it upwards over the roof instead of letting it flow over the door windows. The W116 does this with protruding A-post edges and the E23 uses that black contraption shown in your picture. Mercedes’ solution was rather more substantial than BMW’s though. But hey, ’70s & ’80s Mercs sported design The Gorden describes as ‘forced’, so BMW must’ve been correct when they went for a flimsy piece of black plastic with exposed screws, rather than the body-coloured, chrome-rimmed item those old farts at Sindelfingen chose. A friend of mine swears by buying a run out model. Even more so as cars become more complicated. If you buy a car that’s about to be replaced, you are buying a model where most of the build and technology issues have been ironed out. The dealer will offer you a big discount because the model is no longer as fashionable as it was. Also – and this is pure conjecture, but maybe valid – the assembly line workers will put a little more care and dedication into the final examples off the production line. I don’t think I agree with your assessment, Richard. The sales figures show a rather significant increase in sales for the E32 (311,045 units, rather than 285,250), even without taking into account that the ’32’s production time was more than a year shorter than its predecessors. It was also the first Seven to outsell the S-class in certain markets. On that basis, I’d claim that not only was the car worth the money and commitment in terms of prestige, but also from a fiscal perspective. E38 was, on paper at least, even more successful, with 327,560 units built. These are healthy figures indeed, unless one compares them to the enormous number of W126 S-classes built over the course of eleven years. I don´t think we disagree much. It depends on whether you call 30,000 cars a medium or large increase. I´d call it respectable not outstanding. If it got towards 50,000 I would be even more impressed.